A group of researchers may have found a new set of genes that help to explain why people are usually right-handed. 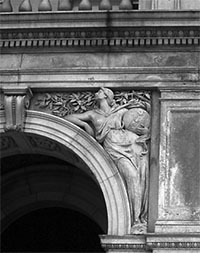 Image courtesy of Wikimedia Commons. 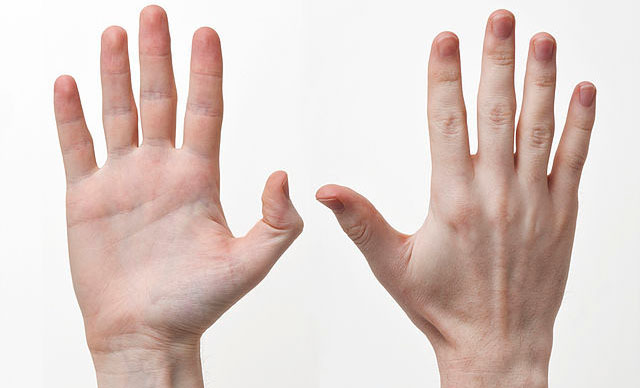 Scientists have struggled for a long time to explain why 85-90% of people are right-handed. They’ve known genetics plays an important role in people occasionally ending up left-handed, but they also know it is not the whole story. The consensus appears to be that around 25% of handedness can be explained by genes. Of course, there is a big difference between knowing genetics is involved and identifying the actual genes. But now it looks like scientists may finally be starting to make some progress in identifying some of these handedness genes. In a new study looking at people with dyslexia, researchers found that genes involved in making our brains and bodies have a distinct left and right side may also be involved in handedness too. If these genes are really important for handedness, then they may also provide an explanation for why most people are right-handed—because language and handedness evolved together, hand in hand. There were hints in earlier research that this might be the case. Speech is housed in the left part of the brain in 95% of right-handed people but only 70% of left-handed people. Clearly there is a connection but it is by no means the whole story as only 30% of lefties use the right side of their brain for language. Right-handedness might have been a useful side effect of evolution sort of like this beautiful spandrel. Image courtesy of Wikimedia Commons. Of course the coevolution of language and handedness is just a theory at this point. There are definitely other theories that claim that being a lefty was an evolutionary disadvantage. For example, one group proposed that lefties are rare because being left-handed impedes cooperation. Since humans do best with a lot of cooperation, most of us would favor one hand over the other. In this scenario we could have ended up left or right-handed…the luck of the draw made us right-handed. These two ideas are not easy to tease apart. For example, there is some evidence that Neanderthals favored their right hand too. But they almost certainly had language and cooperated with one another as well. So the bottom line is that we still don’t know why we evolved to be mostly right-handed. Was it just something that came along with learning to talk or was it an active process or something we haven’t thought of yet? We just don’t know. What this new study does provide is some genes that may be involved in determining handedness. But these genes are almost certainly not all of the possible handedness genes (click here for a bunch more). And besides, handedness isn’t even mostly genetic! We may never be able to simply look at someone’s DNA and predict whether they are a righty or a southpaw. Even left-handed parents only have left-handed kids 26% of the time. Data taken from here. Now if I had to predict, though, I’d predict right-handed every time. As you can see on the right, I’d be right most of the time even if both parents are lefties! In the table, a right-handed parent is represented by an R and a left-handed parent with an L. As you can tell, even two left-handed parents have a right-handed child more often than not. Whatever genes are involved, they are not something Mendel could have easily figured out! Throughout this piece, I keep mentioning the environment. The idea is that we are all born to be right-handed but something in the environment occasionally pushes someone to be left-handed. Genes are involved by making us more or less likely to respond to whatever the environmental triggers are. Scientists do not yet have a great feel for what in the environment might turn someone into a lefty. One idea that has been around for a long time is that difficult pregnancies make being left-handed more likely. Other factors that make someone more likely to be a lefty are if he is a boy or if he or she is one of a pair of twins. There is also some evidence that being either the first born or being the fourth born or higher increases you chances of being a lefty. While we are making progress, we still have a long way to go in figuring out why people are usually right-handed. It’ll be interesting to see if being right-handed was selected for, being left-handed selected against or if it is simply a consequence of language development.